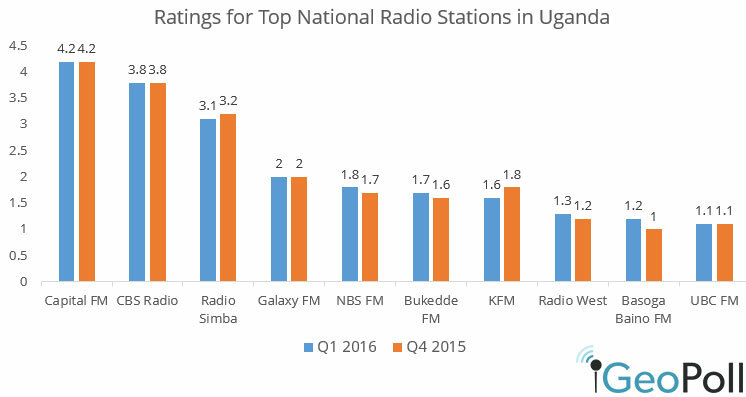 As part of Kantar-GeoPoll Media Measurement‘s daily surveys on audience habits for TV, radio, and print, GeoPoll is pleased to release this report on top TV and radio stations in Uganda, popular viewing times, and more for Q1, 2016. To learn more about KGMM, see a demo of the system, and sign up for an account please contact us. Due to the local nature of radio stations, in Q1 2016 even the leading station, Capital FM, only had on average 10% of the audience share, with 51% of radio audiences listening to “other” local stations. For a more detailed view of listenership that includes data on local radio listenership, contact us to learn more about Kantar GeoPoll Media Measurement.